Pay-as-you-go (PAYGo) is today one of the fastest growing business models within the off-grid lighting and electricity services sectors in Africa. Starting from a contribution of less than 1% of sales in Africa in 2014, it grew to represent 12% of sales across the continent in 2016, while in Kenya it has reached as high as 25% of sales. 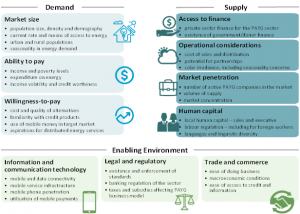 As other off-grid energy solutions confront issues related to access to finance for end-customers, PAYGo has the advantage of providing in-house consumer financing, overcoming a key impediment to expanding energy access. Shifts in consumer demand, coupled with an enhanced value proposition from manufacturers, are driving the off-grid market towards larger solar home systems that come with televisions, radio and other options, as standard features. Prices of these systems increase in accordance with increases in system size. As such, PAYGo is growing in importance as a means of improving access to higher wattage systems, particularly for customers from low-income households. Recognizing this trend, there is an increasing number of off-grid energy services companies operating in the PAYGo space. Despite the success that PAYGo companies have demonstrated over the last few years, a potentially concerning trend is emerging related specifically to market concentration: currently, approximately 85% of all sales from the PAYGo model come from Kenya and Tanzania alone. Moreover, a growing number of new market entrants offering PAYGo solutions are specifically targeting the East African market, which will further increase this concentration. While competition is an encouraging sign of market development, and can significantly enhance the proposition to consumers, it is notable that the focus on East Africa is driven largely by the fact that in this region of SSA, the mobile payment platform and related services are well developed; in general, market intelligence is readily available; and there is a fair degree of comfort with the overall business environment. Despite the potential consumer base for off-grid energy services being significant in other parts of Africa, critical data to support market entry decisions is largely lacking outside of Kenya and Tanzania, impeding PAYGo companies from venturing further afield. In order to help broaden the reach of the PAYGo business model, IFC has developed a Market Attractiveness Index that provides companies with granular data to inform market entry strategies for 14 countries in Africa. 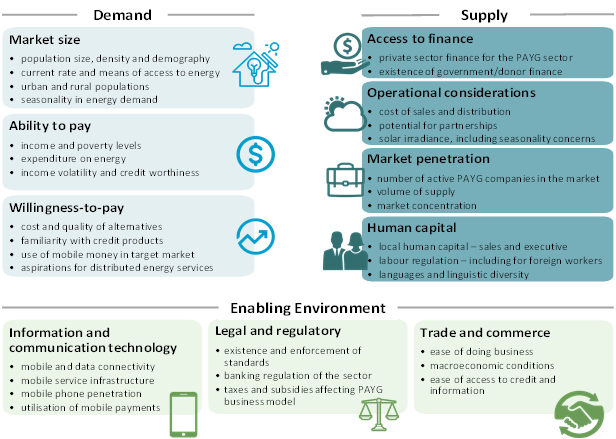 The Index is based on various high-quality datasets covering critical aspects of the commercial opportunity and enabling environment conditions for the 14 selected countries, thereby serving as an analytical tool to support PAYGo companies in evaluating and prioritizing market entry opportunities. The PAYGo Market Attractiveness Index has been structured around three main pillars, comprising a total of 70 individual indicators. This Index is intended to help PAYGo companies, investors, development partners and other stakeholders to assess the opportunities to expand into other markets. The friendly user interface allows for adjustments to the weighting of the different variables, enabling the user to consider different aspects that may affect the underlying business model of the company and identifying specific areas that may present risks to be mitigated. The Index could also be utilized by policy makers and development partners to identify specific gaps or areas that require actions to create a more conducive business environment for PAYGo companies to operate in a given country. Download the index and user guide below or watch the webinar about the Index.